Points South Latin Kitchen – eating my way through Charm City! I am currently in love with Points South. I thought this place was one of those cursed spots in Fells, where nothing could stick around; this spot is here to stay. This ginormous spot has transformed into an inviting space with a focus of Latin flavors on a mostly Central and South American menu. I met the wonderful owner, Bryson Keens, mixing up some drinks behind the bar. I love it when the owners and managers are on site and also helping out. Plus, he is incredibly knowledgeable behind the bar. Points South has changed chefs since the very beginning, but Rey was part of the program from the beginning. Rey Eugenio is known for his food and has been a part of some of the highest regarded restaurants in the city. There is good reason. I started with the Chef’s Ceviche Especial. 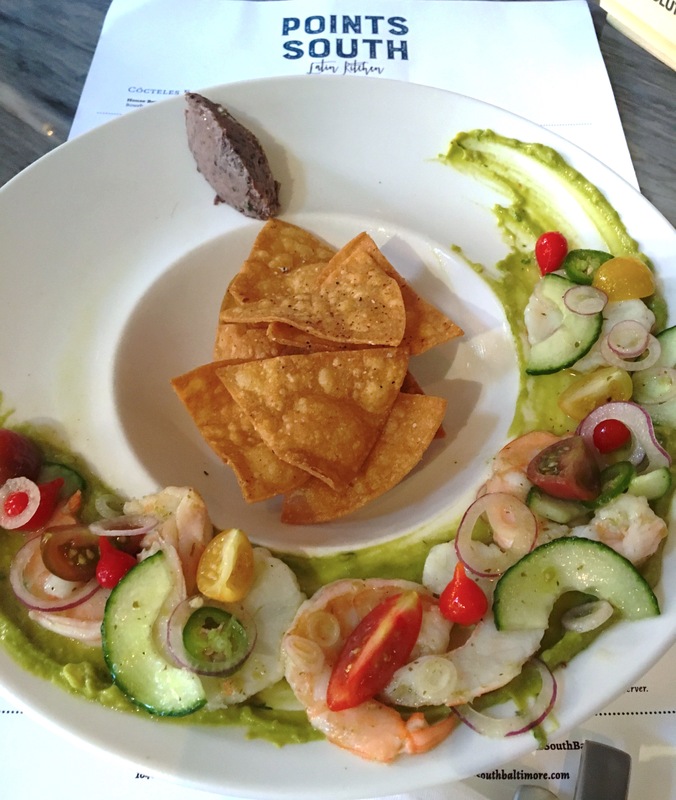 Beautiful, perfectly seasoned shrimp with tomatoes, cucumbers over a guacamole schmear and served with house made chips. Chef fries these to order – no wonder they are so crispy. I imagine it changes regularly, but I wouldn’t be sad to get this ceviche again. One of my favorite dishes, by far, is the Cangrejo y Aguacate: a creamy crab and avocado dish. Chef uses tender and delicate jumbo lump crab mixed with creamy and tangy mojo sauce and avocado. Incredible all on its own. But bonus, they give you a fried yucca cake; crispy crust with a soft melty inside. Yucca might be one of my favorite things from Central and South America. The Costillas de Cordero or Denver Lamb Ribs are some of the best ribs I have eaten. Super tender, fall off the bone tender. The honey chipotle bbq sauce is a perfect balance between sweet and spicy. I cannot even begin to describe how good these are. I think my mouth might be salivating right now as I type this. I get these every time I go here. You will have order envy if you don’t try these! I tried the grilled octopus – the Pulpo a la Parilla. I didn’t love it, but mostly because I don’t like olives, and especially not green olives. I must say the pepita romesco and the jicama with the chili dust is fantastic. This dish will probably blow you away if you are an olive fan. My only downside of this place has been the cocktail program. The wines are out of this world – great choices and great prices. But, the cocktails leave something to be desired – specifically the Pisco Sour – I’m struggling with the idea of it being considered “traditional” without the egg white. This entry was posted in Charm City, Dinner, Fells Point, Hooray!!! Winner!. Bookmark the permalink.